In many parts of the world the winters are too cool and the summers are too hot. In such climates the window air conditioner can be used for cooling in the summers and for heating in the winter. The window air conditioner used as the heater in the winters is called as the heat pump. Instead of the heat pump one can also use the ordinary electric heater for heating the room, but the electric consumption of the electric heater is much more than the heat pump for the same amount of heat produced inside the room. 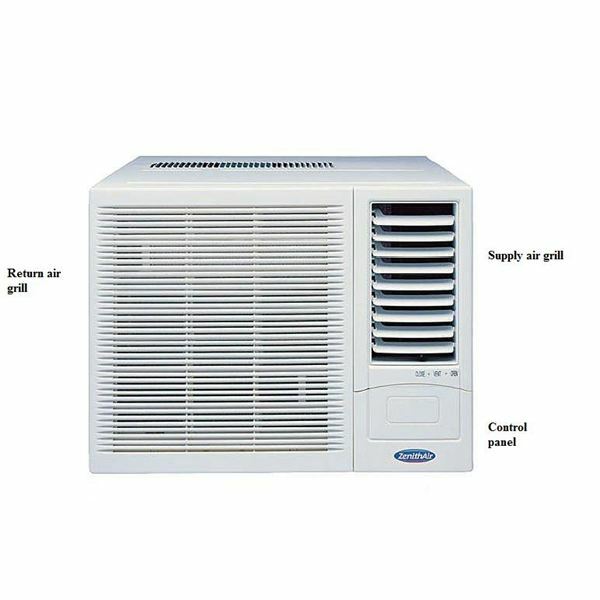 Apart from the compressor and the expansion valve, the window air conditioner has two important heat exchangers: the condenser and the evaporator. 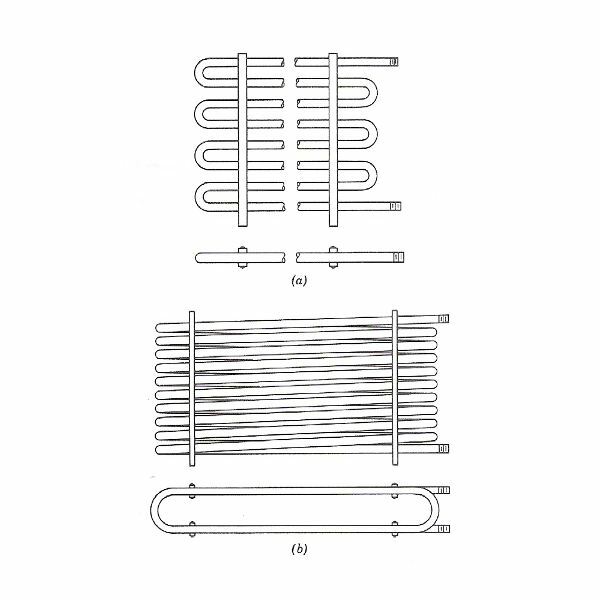 Both, the condenser and the evaporator are made of number of turns of the copper tubing and are covered with the fins to increase their heat transfer rate. The evaporator is located inside the room while the condenser is located outside the room exposed to the external atmosphere. In the summer season the evaporator acts as the cooling coil. The air flows over it, gets cooled and it is supplied to the room for producing the cooling effect. The heat absorbed by the air in the room is thrown to the external atmosphere via the condenser. This is the normal working of the window air conditioner. To use the window AC as the heat pump in the winters the direction of the flow the refrigerant is changed by changing the position of the valve. Due to this the positions of the condenser and the evaporator gets reversed. The condenser becomes evaporator and the evaporator becomes condenser and the machine becomes the heat pump. In heat pump the condenser is located inside the room, while the evaporator is located outside the room. The refrigerant inside the evaporator located outside the room, absorbs the heat from the atmosphere. This heat is liberated inside the room via the condenser. Thus the same coil that was producing the cooling effect in the summers produces heating effect in the winters. The next section of the article shows how the direction of the valve is changed to reverse the function of the condenser and the evaporator. 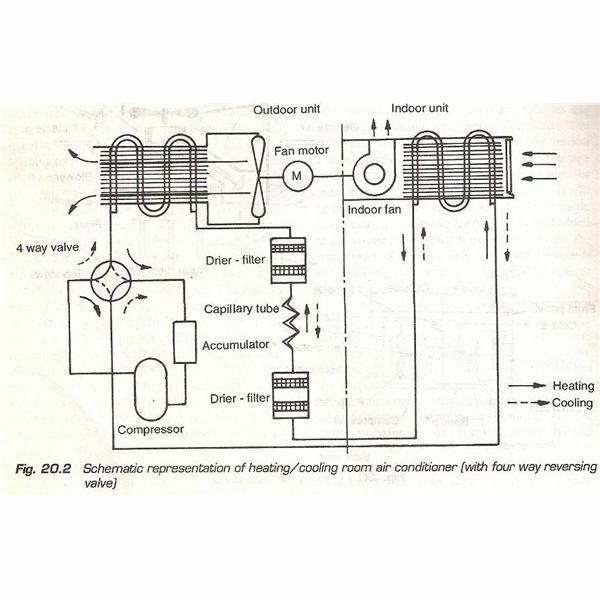 The figure above shows all the parts of the window air conditioner namely, the compressor, condenser, the expansion valve (capillary) and the evaporator. 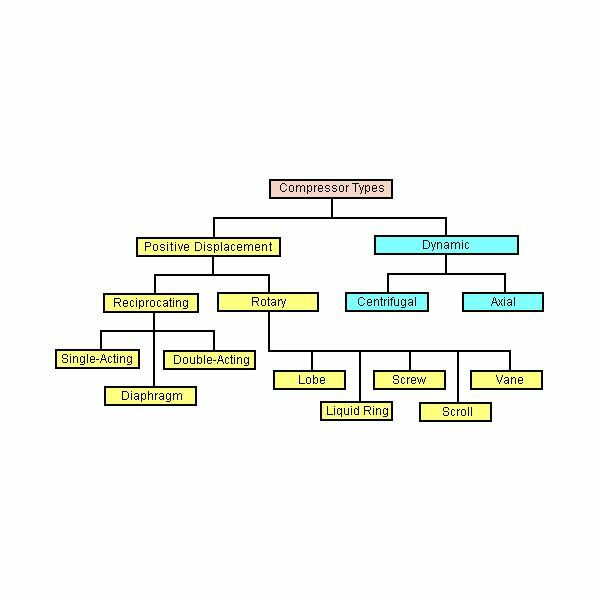 What is different in this air conditioner from the other types of air conditioners is the 4-way reversing valve incorporated within the refrigeration cycle. The reversing valve is the four position valve with four ports. In the figure the air cooling cycle is shown by the dotted line, while the air heating cycle is shown by the continuous line. In the normal course of running in the summer seasons, when the air conditioner works as the cooler, the indoor unit acts as the evaporator or the cooling coil and outdoor unit acts as the condenser. 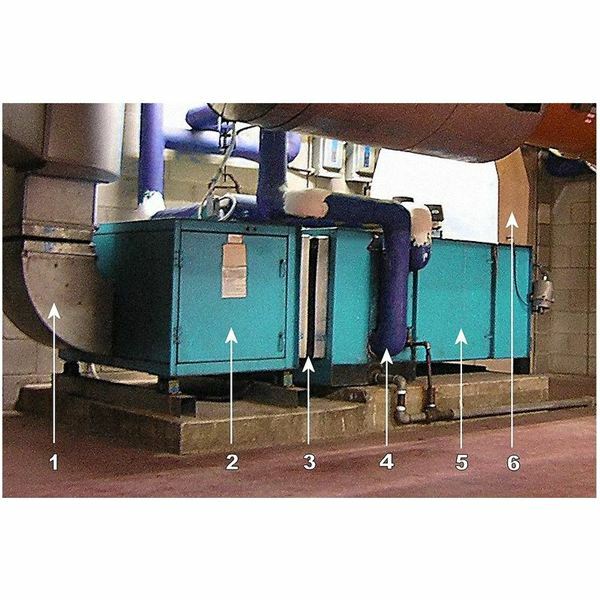 Due to this the cooling effect is produced inside the room, while the heat is rejected to the atmosphere. In the winters, when the atmospheric temperature is too low, the position of the reversing valve is changed and the machine works as the heat pump. 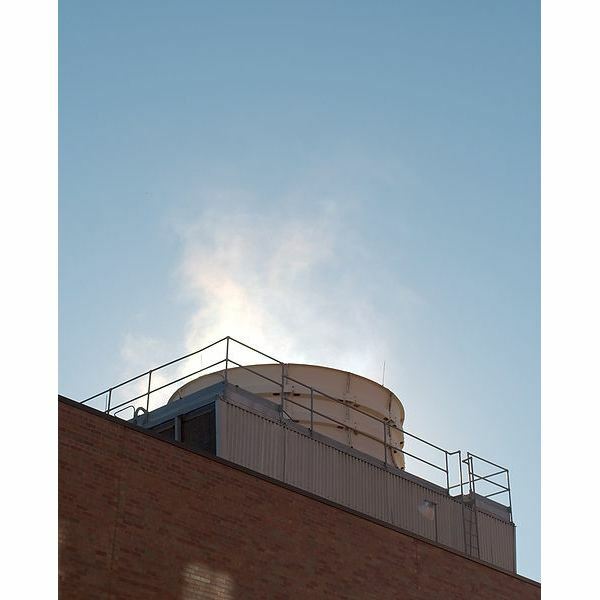 The indoor unit becomes the condenser and the outdoor unit becomes the evaporator. The outdoor unit absorbs the heat from the atmosphere and releases it inside the room via the condenser to produce the heating effect. The reversing valve changes the direction of the flow of the refrigerant and plays the vital role between the air conditioner and heat pump. 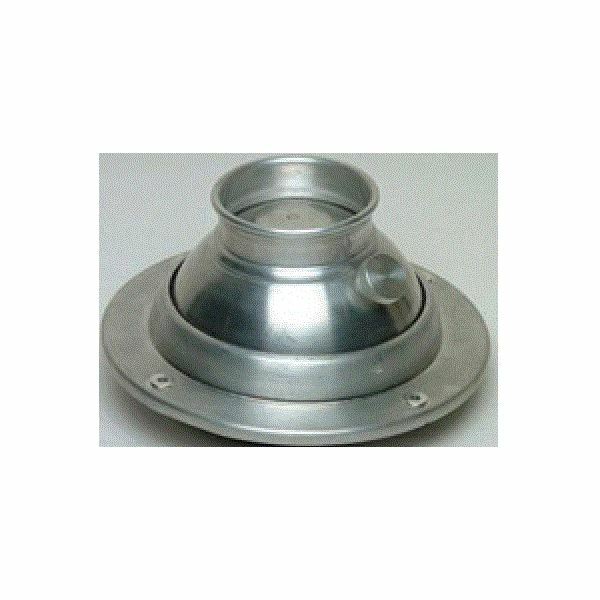 This method of reverse valve can work in the atmospheres where the external temperature during the winter season is around 3 to 4 degree C. If the atmospheric temperature is below this, the frost will be formed on the surface of the evaporator and its working will be hampered. 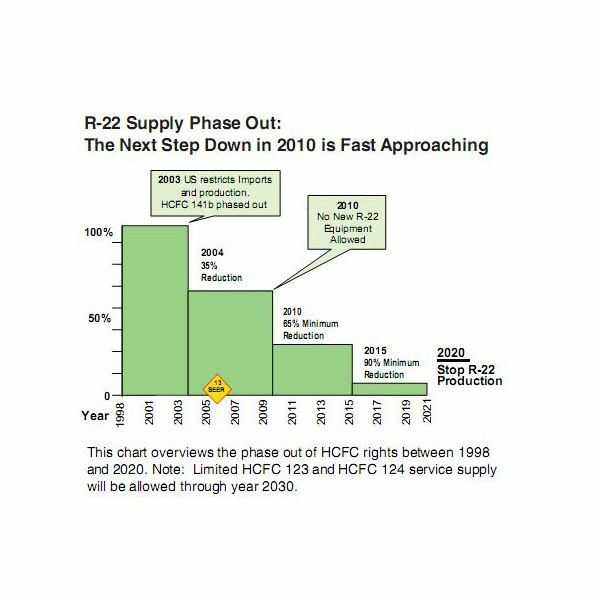 For effective heat transfer in low temperatures, the frost should be removed from the evaporator at regular intervals. In places where there is extremely low temperature, the defrost system can be employed to remove the frost from evaporator automatically. Even the reversing valve can be operated automatically by using the solenoid valve and operating it with the switch. 1) Book: Basic Refrigeration and Air Conditioning by P. N. Ananthanarayan, Tata Mc-Graw Hill Publishing Company Limited, Second Edition, page no. 214. This post is part of the series: What is Room Air Conditioner? Window Air Conditioners. 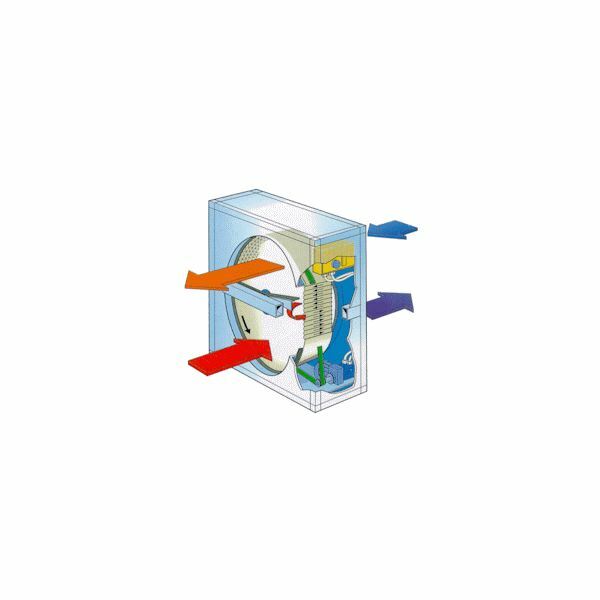 This is the series of articles that describes various parts of the window air conditioners, the working of the window air conditioners and the installation of the window air conditioners. How the Window Air Conditioner Works?